Preventing failure of any wellbore integrity is critical. A failure can result in lost production, environmental pollution, and costly repairs. The first step to prevention is to monitor wells to determine if corrosion, erosion, or geological deformation has compromised the integrity of the well. If defects in the well’s integrity are known before they become catastrophic, an inexpensive corrective action may be implemented to extend the life and net profit for the well. 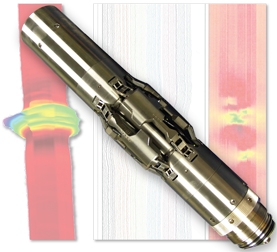 The Casing Inspection Tool utilizes Magnetic Flux Leakage technology to determine changes in the pipe wall thickness. This is the same technology that is used in monitoring most pipelines. The technology can measure metal loss both internally and externally. 0.125 inch (3.2 mm) sampling at 120 feet per minute. The magnetic circuit of the CIT was extensively modeled to ensure the design would provide the magnetic field strength necessary to saturate the casing. Depending on casing size, the MFL sensor section has 8 to 16 pads. Each pad has 8 magnetic field sensors for measuring the magnetic flux leakage independent of logging speed, and two shallow discriminator measurements to determine if the measured flux leakage is internal or external. Together with a high speed memory section, the CIT provides the highest resolution 3D image of the integrity of the casing. Optimized MFL Sections for larger casing sizes. Surface Read Out quick look interpretation with high resolution memory data or memory only operation. Combinable with a Multi-Finger Caliper tool for internal diameter information.